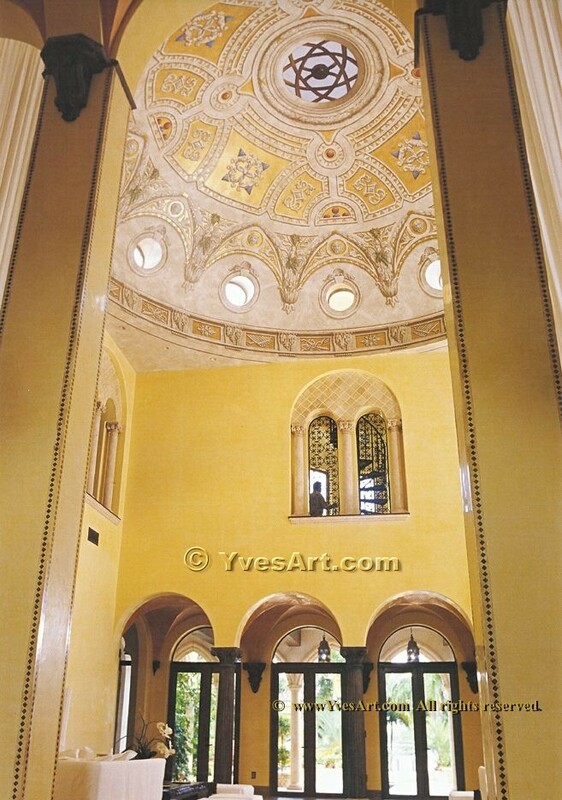 Trompe L'Oeil Ceiling, Star Island Dome, hand painted by Yves Lanthier.
" Star Island Dome "
This 35 ft. diameter Dome is a good example of the workmanship & expertise needed to execute a design of this magnitude. Yves spent one month on the drawing table to come up with this unique design and six months to paint this magnificent 40 ft. wide Dome. Medium: Acrylic. The twelve round windows were a real challenge since none of them were placed at the same height. the harmony and balance of this design. twelve brackets arched with 48 Dragons panels and 12 lion heads. Above : An incredible and intricate design paneled, toped with a dome "astral".